The number of cars on the world’s roads is expected to reach two billion by 2040, significantly increasing pollution and congestion levels in urban areas. 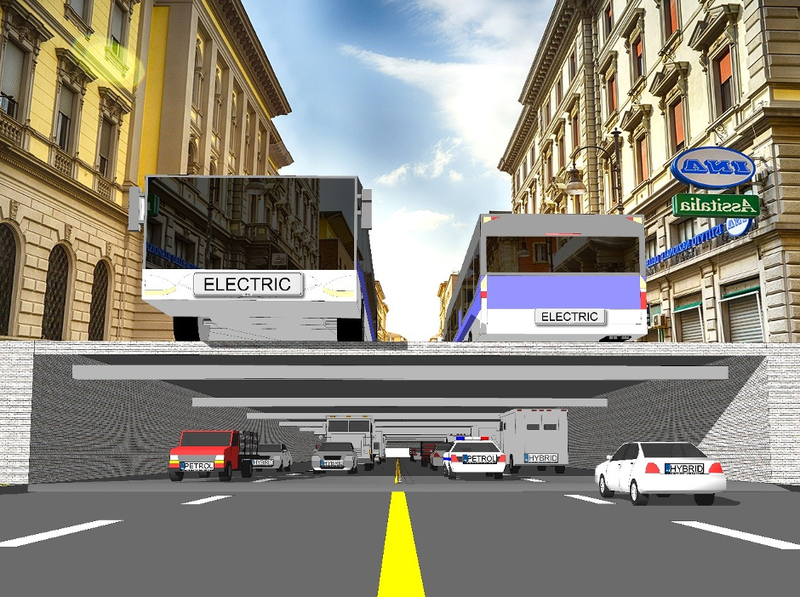 Now researchers at Nottingham University have developed a concept to alleviate environmental and traffic problems associated with the greater use of vehicles, based on a network of subterranean roads. Unlike tunnels, which can be difficult and expensive to build, particularly over large distances, the idea would be to dig channels within the ground, several metres in depth, according to Prof Saffa Riffat, chair in sustainable energy at Nottingham’s faculty of engineering, who has developed the idea alongside research fellow Prof Yijun Yuan, a specialist in mining engineering and sustainable energy. The pair have also recently unveiled plans to build underground farms within the disused tunnels of depleted mines, as well as deep sea farms within floating containers, and deep farms within shafts dug into the sand in desert regions. “Compared to building tunnels, it would be much easier to create a channel in the ground and put a prefabricated surface road on top, allowing you to have twice the area for vehicles to travel on,” said Riffat. Deep roads would not be affected by weather conditions such as snow, ice, wind and rain, increasing safety and allowing cars to maintain a steady speed, improving their fuel efficiency. The surface road above could be limited to lightweight, environmentally-friendly forms of transportation such as bicycles and electric vehicles, while petrol or hybrid cars could travel within the channel, said Riffat. This would increase safety for pedestrians and cyclists, and reduce noise pollution in urban areas, he said. “It would also mean we could capture the pollutants from these vehicles, because you can’t easily capture pollutants once they’re in the atmosphere, but you can capture them from a sealed environment quite easily, using ducts,” he said. The captured carbon dioxide could then be used in intensive farming, he added. In hotter environments, evaporative cooling could be used to maintain a steady temperature within the deep roads. A closed water system would pump over the tunnel cover and then flow back into the road walls, which would be covered in a hydrophilic surface. The deep road system could also include shafts designed for car parking, as well as bicycle and water storage, said Riffat. What a farce, especially as Nottingham University used to have a mining department and a host of research which shows disused coal mines cannot be used because they are expensive to access, require constant maintenance, and need huge amounts of ventilation to name but a few. It appears they have concepts based on a total lack of knowledge and I have seen many of their proposals and ask one simple question, where is the money coming from to build and then maintain such structures, and of course I never get an answer. I did not think that you get the right concept, now many high way etc use high based road which means several meters above the ground, the deep road way just several meters below the surface which is much less cost than high based road, overhead bridge, and subway tunnels. I agree with that the cost is essential, and our way is to provide cost way. for mine, we did not need ventilation and people are not required to go down into the mines. The project has been discussed with the Coal Board in Mansfield and the board has agreed to provide three mines to carry out the work. I have also been offered 70 mine shafts in North of England and large number of well maintained tunnels in Cambridgeshire to carry out large scale demonstration. I am in discussion with investors from the the US and South Africa to carry out further demonstrators and also waiting for £1 million funding from Innovate UK to carry out project in collaboration with several major companies. I should have a full demonstrator in about 6-8 months. I have been in discussion with several previous coal minors and they are very excited about the work and fully support the idea. I am in early stage of development as I have started the work 2-3 months ago. Your remarks are not helpful.